The announcement Wednesday marks the end of a two-year investigation into the deadly police shooting. San Francisco police officers will not be charged in the shooting death of Amilcar Perez-Lopez, District Attorney George Gascón said Wednesday. 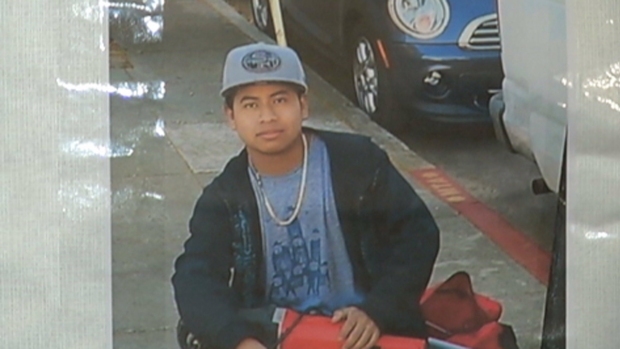 Perez-Lopez, a Guatemalan man, was fatally shot by officers in the Mission District on Feb. 26, 2015. Officers at the time were responding to a 911 report of a man running with a knife down Folsom Street toward 25th Street, chasing another man, officials said. Gascón said it took two years to gather evidence and interview three dozen witnesses. San Francisco police officers will not be charged in the shooting death of Amilcar Perez-Lopez, District Attorney George Gascón said Wednesday. Sharon Katsuda reports. The DA's Office launched an investigation shortly after the shooting. Activists criticized the slow pace of the investigation and in August held a vigil and rally to mark the 18-month anniversary of Lopez's death. Gascon said the investigation was delayed in part because some witnesses came forward a year or more after the incident, opening up new lines of inquiry and prompting investigators to seek input from expert witnesses. The DA's Office at news conference Wednesday released animation of what they believe happened during the 2015 shooting. The DA's Office said Perez-Lopez died from six gunshot wounds by police, had a knife and the officers used deadly force in self defense. The decision sparked protests in San Francisco later Wednesday, as people stood in the middle of the street, blocking traffic and calling for justice. Leaders of a San Francisco minority group say the DA's decision is fueling resentment toward police that's reaching a critical point. "Pressure breaks a pipe. You understand? And when it gets like that, it's gonna explode," said DeJenney Davis of the Black & Brown Social Club. A rally Thursday on the steps of San Francisco's Hall of Justice called on the district attorney to make a decision about whether to charge officers in the 2015 police shooting of a Guatemalan man. Christie Smith reports. A spokesman for the San Francisco Police Officers Association called the incident tragic and hopes the decision will not drive a wedge between the community and police. "We have always anticipated that the district attorney would refuse to bring charges against the officers who killed Amilcar Perez Lopez. The long-awaited decision comes as no surprise. Rarely, if ever, do prosecutors bring charges against police officers in shooting cases. Instead, as Mr. Gascon did today, prosecutors will make every effort to give the officers the benefit of every doubt. For example, the inconsistencies in the officer’s versions which the DA’s report points out are deep and meaningful. Yet, for Mr. Gascon, these inconsistencies are superficial and he is willing to overlook them. Such meaningful differences in the accounts given by co-defendants in a shooting would have doomed them both to being prosecuted and likely convicted. Unlike the prosecution of other shootings which do not involve police officers, prosecutors are eager to take on such cases. Here, because the killers were police officers, Mr. Gascon has shied away from his duty to do justice. It takes courage and a true commitment to justice to take on the police. It’s a shame that the District Attorney would not carry out his duty to impartially apply the law." "Today, the San Francisco District Attorney’s office announced that it will not be pressing charges against the officers involved in the 2015 shooting of Amilcar Perez-Lopez. While the DA’s decision makes it clear that the responding officers are not guilty of any crime, there is no doubt that this incident was tragic for everyone involved. It left a family to grieve for a loved one, and it forever changed the lives of the officers involved. We cannot let this pain be a wedge between us. Instead, it should motivate us to work together as a community to prevent future tragedies from taking place. This means putting in place smart policies and introducing 21st century tools that will protect both the public and police officers. NBC Bay Area's Thom Jensen and Bay City News contributed to this report.